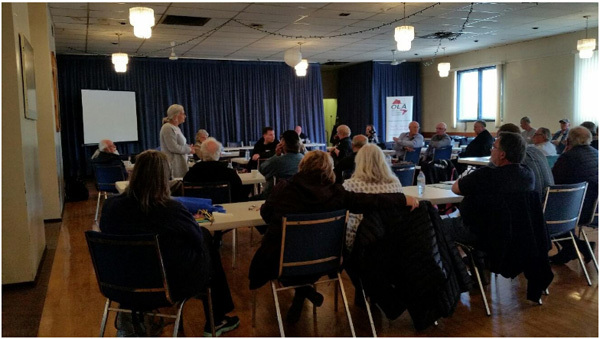 This year, the Ontario Landowners Association (OLA) held their Annual General Meeting (AGM) in Cobourg at the Legion on Orr Street on October 13, 2018. Twelve county groups were represented at the AGM, a very good showing. There were about 35 delegates and members at the meeting. This was a significant AGM, as Tom Black, who has been President of the OLA for seven years, officially stepped down at the meeting. There was a presentation to Tom and Marlene Black thanking them for their considerable contribution to the private property rights movement and to the OLA. Tom Black moves to Past-President. Since there were no nominations for President, Jeff Bogearts, with the support of the delegates, will act as Interim President. The position will be revisited at the Spring Directors’ Meeting. In the afternoon, there was an excellent presentation by Dr Magda Havas, from Trent University, about the adverse health effects of microwave radiation, including from 5G wireless technology which the federal government is planning to roll out across Canada. Dr Havas was assisted by Sheena Symington who demonstrated the measurement of microwave radiation coming from a baby monitor. You can read more about Dr. Havas and her study of electromagnetic radiation here https://magdahavas.com. You may also be interested in https://eraoflight.com/2018/10/26/britains-first-5g-court-case-and-the-people-won.